Technically I was in Portland to attend a professional conference, but in case it wasn’t obvious, I blew off some of the part that involved sitting in windowless hotel rooms listening to other people talk. Due to a rare convergence of travel schedules, my kids were in Washington with my mom while Matt was flying to China. But I had a pretty non-negotiable commitment to give a talk on Saturday morning in Portland, so I wasn’t going anywhere until then. So on Thursday and Friday, for the first time that I can remember, I had minimal work obligations and zero responsibility for my kids. And I was in a city filled with awesome bike shops and a bunch of friends from graduate school that happened to be experiencing a freak early spring. 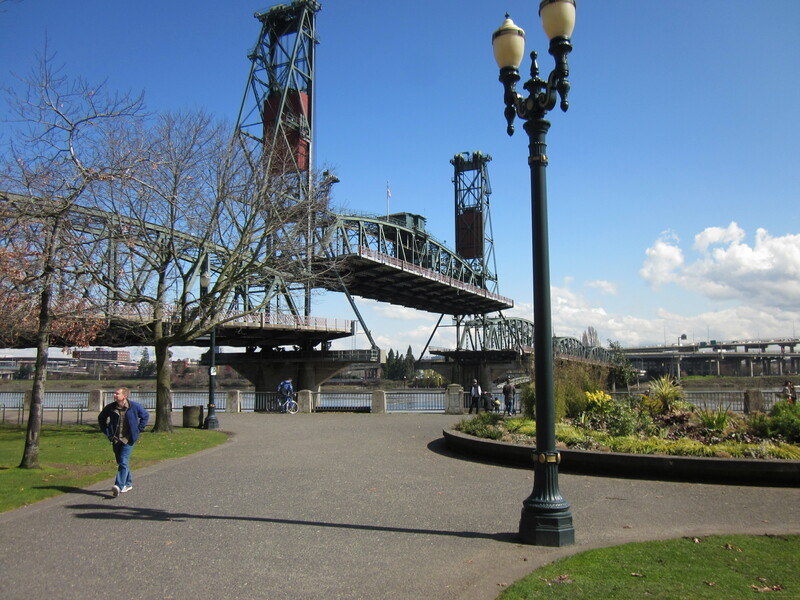 The result was that most of the time I bounced around Portland feeling as giddy as a dental patient on nitrous oxide, without any of the painful drilling. 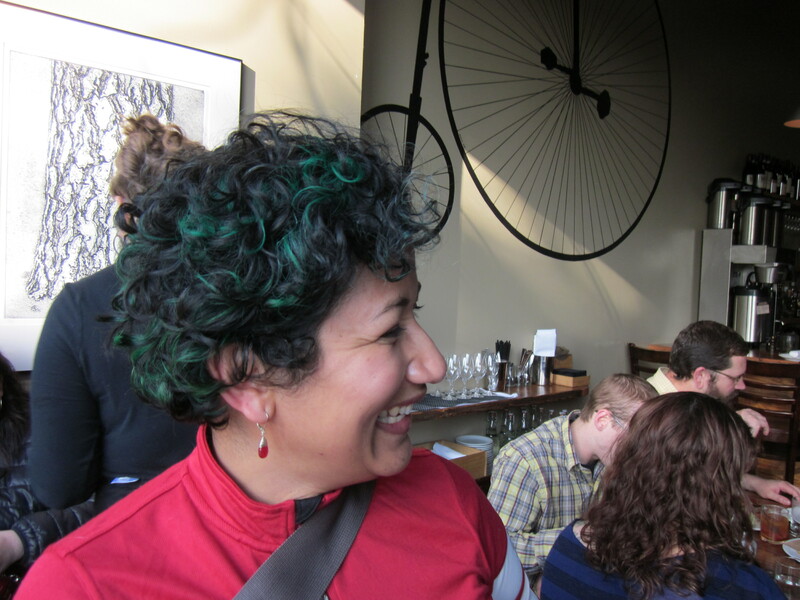 My friend Todd, who lives in Portland, got conscripted to be the cargo on a cargo bike, but my friend Jackie, who also lives in Portland, actually rides a bike of her own. This is something of an understatement, as she regularly rides Cycle Oregon. She has a road bike like a real racer and wears lycra. In fact she has three bikes. When she told me she was impressed that I commuted on my bicycle, my reaction was complete disbelief. I’m pretty pleased with myself if I cover 5 miles; she sends us updates on her long rides every ten miles or so. Sometimes there are several of these in a single day. Anyway given that I had a rental bike in Portland it seemed like it would be fun to ride it to meet her somewhere, and so that’s what I did. She picked a restaurant between her house and my hotel and gave me what seemed to be pretty implausible directions, which I summarized mentally as, “It’s complicated, so do what the other bicycles are doing.” It seemed kind of optimistic to assume that there would be enough other riders around to make the route obvious, but boy, was I wrong. I am used to riding in car traffic, but rarely ride in bicycle traffic. Even in the Panhandle, which I used to consider a busy route, the bikes are pretty spread out. 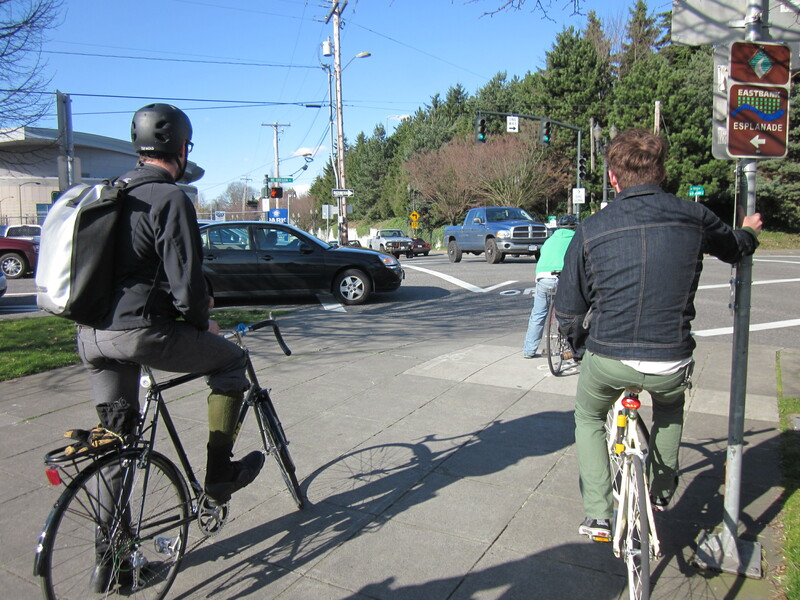 But riding in Portland during commute hours was actually a little unnerving, because there were dozens of bicycles in the lane. 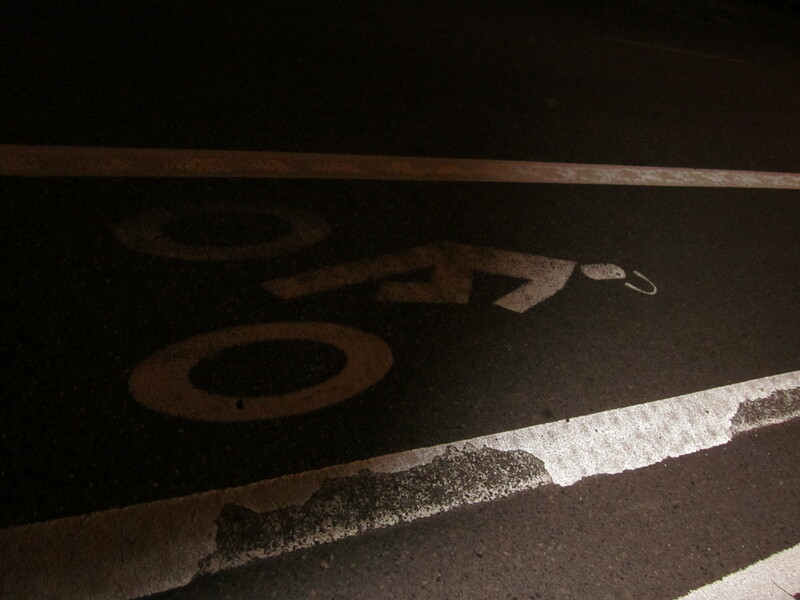 At more than one point during my ride I wanted to stop and get a picture of one of Portland’s many weird and wonderful bike lane markers, which include disembodied riders without bicycles, riders wearing helmets and riders not wearing helmets without any apparent rhyme or reason, riders with the heads of dogs, riders flying off their bicycles jauntily, etc. But I couldn’t figure out how to politely stop to snap a photo. That never happens to me in San Francisco. Jackie picked an amazing restaurant, of course. And its bathrooms were in a hallway shared with a yoga studio featuring a row of inside bike parking against the wall. And those bathrooms had showers. Really, Portland? Really? It is rare that I have the occasion to feel like a yokel after living in San Francisco for several years. But I might as well have been barefoot and wearing a straw hat and overalls with all the gaping I did when I saw things like this. 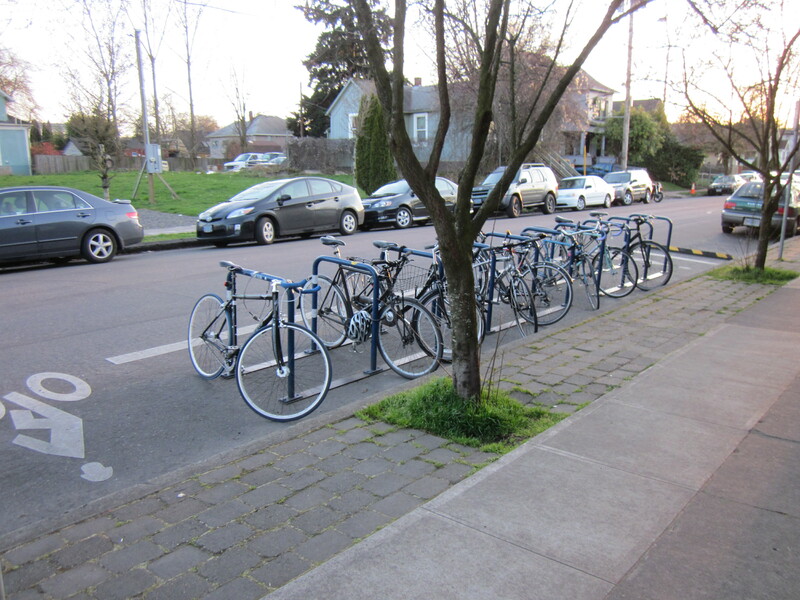 Portland has ripped out street parking for cars to put in bike corrals. And it’s not just a demonstration project, it’s all over the place. And those bike corrals are full. What better advertisement for your bike shop than a beer bike? After dinner Jackie proposed that we ride over to see another grad school friend she sees regularly but I hadn’t seen in years. Steve lives in a pretty neighborhood with his lovely wife and two charming little girls, and was making dinner for them when we appeared unannounced on his front porch. They are in the school lottery for a Japanese bilingual program for the girls, and so we had lots to talk about. Jackie, who speaks excellent Japanese, thought it wasn’t such a hard language. I, who can speak just enough Japanese that I might be able to find a bathroom and not starve if air-dropped into Tokyo, disagreed, as did Steve. Steve offered us beers. Everyone offered me beer constantly while I was in Portland, it’s even more of a thing than the bikes. 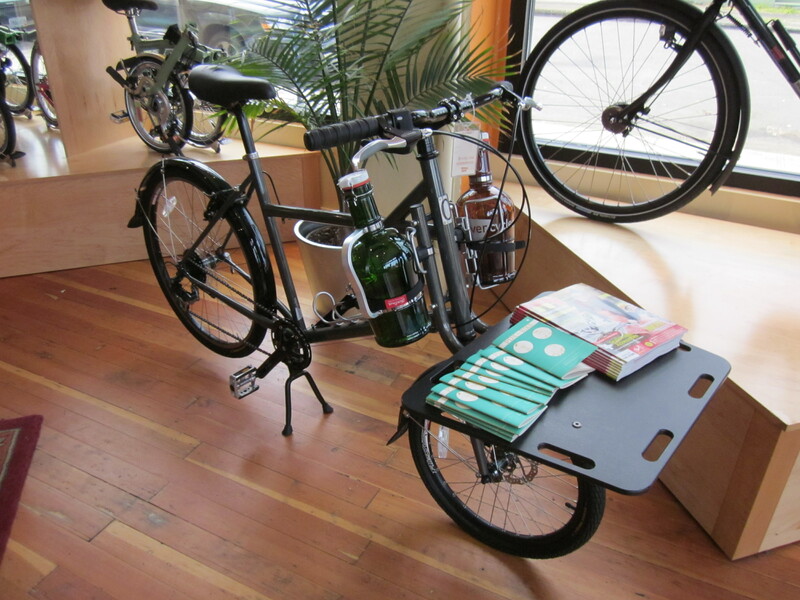 These twin obsessions were perfectly merged in a bike I saw at Clever Cycles rigged to carry two growlers. I’m not a huge beer fan and people always seemed vaguely disbelieving when I declined their offers, like I’d just belched in their faces but they were too polite to comment. I asked Steve what he’d been up to for the last few years; I hadn’t seen him since before we’d had kids. “Oh, nothing much,” he said. “He won a Pulitzer and was a finalist for a second one,” said Jackie. This is why I don’t get to live in Portland. I am insufficiently awesome. I realize that living in one place long enough can make a city’s charms less obvious, and people in Portland complain that there is still a lot of work to do. But to my outside eyes, it looks like paradise. Nice post about One Response to It is in no way an overstatement to call Portland the bicycling capital of North America. Thank you for sharing with us. I think it would be effective for all posting. I like this post indeed.keep up it .